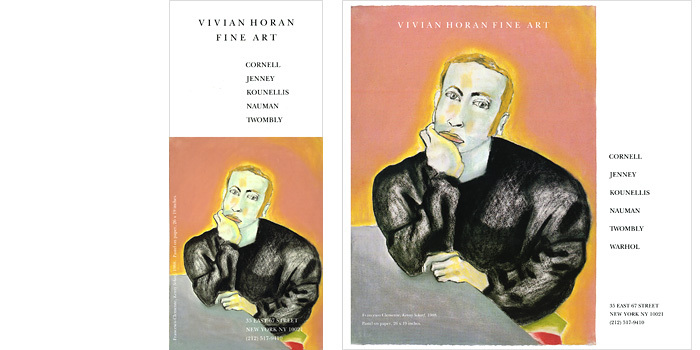 Advertising For Vivian Horan Fine Art's group exhibition of European and American contemporary masters, we featured an exquisite pastel by Francesco Clemente titled Kenny Sharf, 1988, along with an elegant and understated treatment of the typography for this Art Forum advertisement. The layout was re-sized and re-formatted for a half-page advertisement in Art in America. Clemente made drawings and other works on paper in the 1980s, pursuing what would become his signature subjects: the human form, sexuality, myth and spirituality, and dreamlike visions.